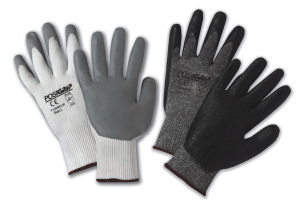 West Chester Holdings’ new Lunar Foam Nitrile palm dip gloves feature a white or salt-and-pepper nylon shell dipped over the finger tips and palm, offering offers full saddle coverage, the company says. The gloves come in sizes XS to XXL, are machine washable and have antibacterial surfactants to prevent the formation of odour and bacteria. They are suited for wet, dry and oily applications, including bottling, canning, materials handling, recycling, manufacturing and small parts assembly.